Provides essential protection for devices with 8" screens. Universal cradle securely holds your device in place with shock absorbing corners. Rotates to both landscape and portrait orientation. Padded exterior surrounds the tablet with a durable elastic cord for a secure closure. Soft, plush interior protects the screen from scratches. Back corner folds down to expose the camera lens on most tablets. 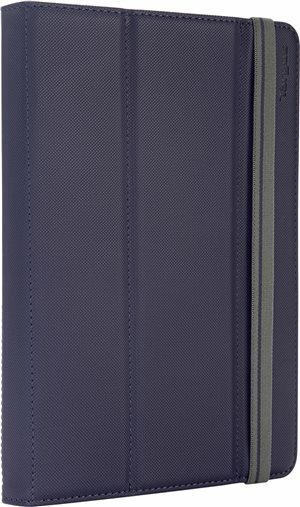 The Targus Fit & Grip Universal Protective Tablet Case provides protection for devices with 7”- 8” screens. The universal cradle securely holds your device in place with shock absorbing corners, while the semi-rigid exterior surrounds your tablet. Combined, these 2 features provide protection that meet military specifications for a 4 foot drop. The cradle also rotates providing landscape and portrait viewing, and can be positioned for several viewing and typing angles. The microfiber interior protects your screen from scratches. Designed to protect your device at all times, but passes military specifications to protect from a 4 foot drop when closed with the elastic band secured. The protective cradle rotates 360° to allow for portrait and landscape viewing. Whether opened or closed, all ports, buttons and controls are accessible. To take a photo or video, fold the corner of the case back, point and shoot. Fold the cover all the way back for a traditional tablet presentation. The microfiber helps prevent scratches to body and screen when the device is not in use.